Two major development have lead to the establishment of U®AIDE as a social enterprise in 2011. One development was the emergence of a new type of governance that assumes the role of collaborator in partnerships. The second trend is diminishing civil society space world-wide due to detachment of political leadership from local constituencies. U®AIDE aims to broker partnerships that maintain rigor in societies and treasure countervailing power while maximizing comparative advantages. 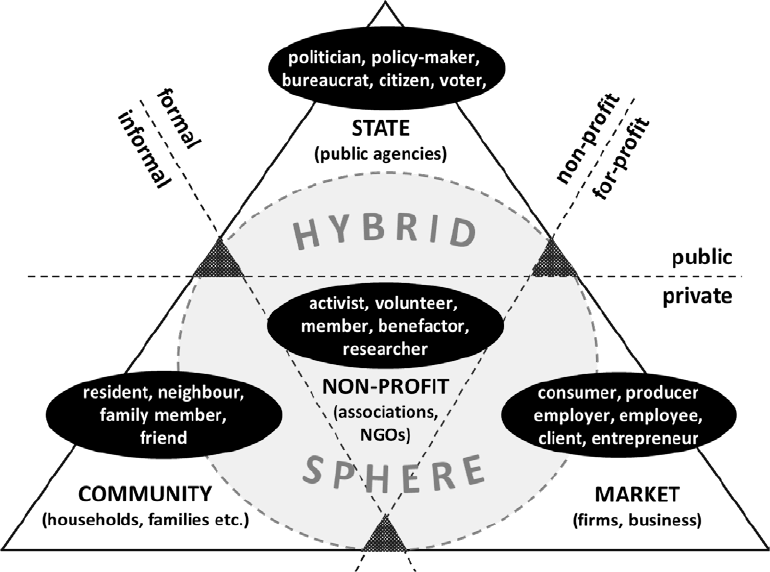 The conceptualization of civil society, or the Third Sector as it is sometimes called, as a space is further explored in a number of research projects of the EMES network and further developed by authors like Avelino & Wittmayer (2014) and depicted in the figure above. This space is made of up of three boundaries: between public and private, between for-profit and not-for-profit and between formal and informal. Globally this space is shrinking.